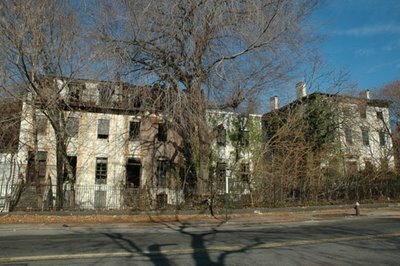 The historic Admiral's Row mansions are in better shape than they appear and could be saved, a federal study has found. A report commissioned by the National Guard - which owns the 10 buildings in the Brooklyn Navy Yard that housed naval officers and their families for nearly a century - found that eight are "structurally sound" and in no danger of collapsing. "Admiral's Row district retains an extremely high level of integrity," stated the draft report, which was expected to be presented at a public hearing last night. But renovating the homes would come with a high price tag, according to the report - an estimated $20 million. Navy Yard officials, who want to tear down the houses and build a supermarket, were angry about the report's findings - and immediately started playing hardball. "If the federal government...requires that some or all of these structures be rebuilt from the ground up...neither the City of New York or the [Brooklyn Navy Yard Development Corp.] are interested in acquiring and developing the site and it will continue to lay fallow for years to come," wrote Navy Yard Development Corp. President Andrew Kimball yesterday in response to the report. Even if the city retains ownership of the property, it cannot go against the final recommendations of the report, which are yet to come, National Guard officials said. We will post updates later as they are available about last night's meeting. UPDATE: Brownstoner has a full report on the press conference before the meeting at which City Council Members Letitia James and David Yassky and Borough President Marty Markowitz all called for the demolition of the historic buildings, casting it in classic inner-city jobs versus costly preservation context. Mr. Brownstoner's analysis is insightful and cuts to the heart of the matter.